Gislason talks with former Cobber hockey player Andrew Deters between periods. It’s one hour before game time inside the Moorhead Sports Center and the press box is empty except for one man. He sits in silence at a stall reviewing notes and looking over stat sheets as the two teams, set to face off on the ice, play soccer along the outer ring of the arena to warm up. This scenario has played itself out countless times in the MSC before Moorhead High hockey games, but for Concordia this is a new venture. 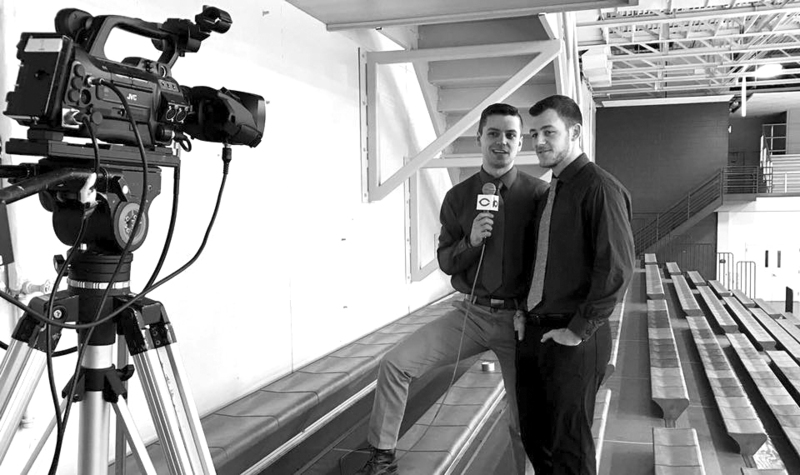 Concordia began streaming men and women’s hockey games this season, and 25-year-old Concordia alumnus Ben Gislason was found to be a natural fit for the play-by-play job. Gislason announces games in the cities for a company called Prep Spotlight TV that streams high school sporting events online and drives up on the weekends to broadcast games for the Cobbers. For Gislason, his position announcing play-by-play is a chance to catch up with old teammates and build his resume. Broadcasting has been Gislason’s dream since childhood. “My mom would tell me that she thought I was going crazy when I was like four in the backseat of the car babbling on and on… but actually I was calling hockey games,” Gislason said. A 2016 Concordia graduate, Gislason majored in multimedia journalism with the hope of a future professional broadcasting job. The Burnsville, Minn. native attended the Breck School in Golden Valley, where he won a Class A state championship in 2010 with the Mustang hockey team. Gis — as those within the Concordia hockey bubble know him — played two years of junior hockey in the North American Hockey League before moving to the college ranks at St. Olaf. He then played two years with the Oles before transferring to Concordia. The move to Moorhead was a bit of a happy accident for Gislason. “It started out as a hockey move. I played one bad game my sophomore year for St. Olaf and didn’t play the rest of the year … [Concordia Head Coach Chris] Howe hounded me in juniors and really wanted me, and Concordia had a journalism program,” Gislason said. A self-proclaimed defensive-defenseman, Gislason relished the playing time that came with his new role on a new team. The defenseman tallied six points in 40 games for the Cobbers between 2014 and 2016. Concordia returns home from last weekend’s meet against St. Thomas to face off with St. Olaf at Moorhead Youth Hockey on Friday. Those games will be streamed with Ben’s commentary at http://www.ustream. tv/channel/concordia-college.